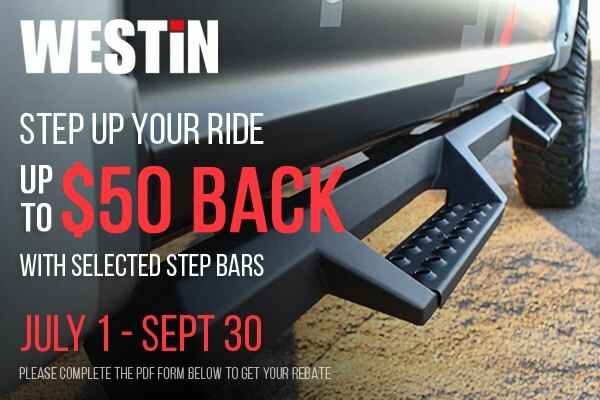 Selected Side Steps from Westin on Sale at CARiD - Get up to $50 Back! - Ford F150 Forums - Ford F-Series Truck Community. Selected Side Steps from Westin on Sale at CARiD - Get up to $50 Back! Until the end of the month, we welcome you to take advantage of our exclusive offer on selected Westin side steps and save some cash. Don't miss your chance to save up to $50 on your purchase! Please complete the PDF form and follow instructions to get your rebate. All side steps developed and manufactured by Westin are designed with the specifications of your truck in mind and made from the finest quality materials to offer you the ultimate when it comes to long-lasting durability and reliability. See more details about the manufacturer on our website. View the full list of selected side steps in the PDF form above! Push the risks aside from your Ford with GEM Bull Bar on! Quick Reply: Selected Side Steps from Westin on Sale at CARiD - Get up to $50 Back!